Yardley is a brand that we all know, but tend to associate with grannies and talc but I recently attended the launch of the new Yardley London Hermina fragrance – and was very pleasantly surprised. I can tell you now that all talc-related judgements have been cast aside. The new Yardley London perfumes are modern and elegant, and what better way to encapsulate that then with a Modern Calligraphy workshop? To be honest, when I received the invite I was a bit like Yardley? What’s new there? However the Calligraphy workshop got me really intrigued – mainly because I haven’t got a creative, drawing-type bone in my body (specifically my hands, with the exception of piano playing fingers) but even then – the closest I got to calligraphy was a pile of Berol pens and dusty “calligraphy for kids” gift set back in the 90s. The new Hermina fragrance is really lovely – I was dreading that it might be heavily floral and rose-based but it’s actually surprisingly clean and light – and modern. Definitely not something I thought I’d say given that as a fragrance house, Yardley is an institution that has been around since 1770! Following the trend for adrogynous, unisex scents (my personal go-to is Dior Homme Cologne, I feel SO on trend lol), Hermina has a woody, amber base with a heart of fig, black pepper and peach flower, with lemon and bergamot in the top notes. The result is something that’s clean and fresh, whilst retaining an elegant, sensual body with the spicier, deeper notes. If you like sweet, sparkly scents then this probably isn’t for you but it’s not at all floral and old fashioned like I thought it might be. 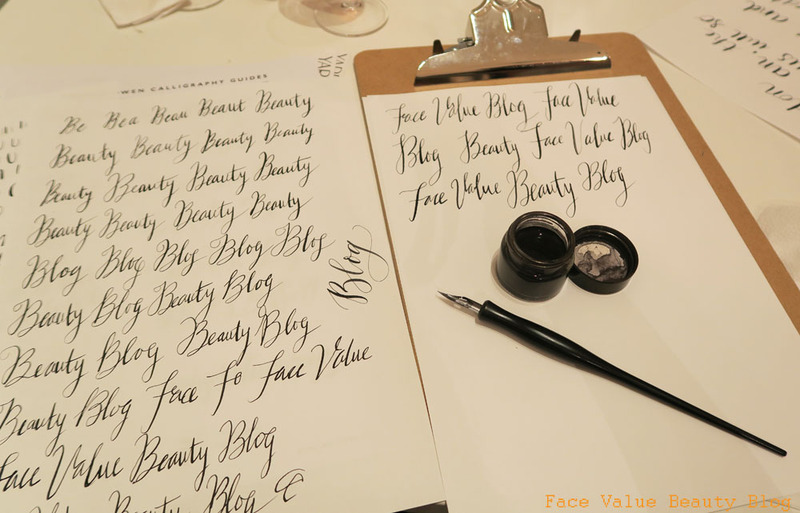 Moving onto the other new stuff in the room – the calligraphy workshop at Quill London was SO MUCH FUN. It’s the new “colouring in”, if you know what i mean. Genuinely, so relaxing, I could get lost in the loops and swoops for a while. Quill London itself is a gorgeously quaint little stationary shop near Angel and they do regular calligraphy classes and workshops, as well as selling a range of swoonsome stationary. Our lovely instructor Immie Owen taught us the basics of calligraphy – we did a couple practice strokes and then onwards to finding our inner illustrator! The general concept is around the pressure – you want thicker pressure for downwards strokes and light as a feather (or should that be a quill LOLLL) for the upwards strokes. Either way, it takes a bit of practice but I’ve got my own quill set so I can do a bit when I feel like unwinding. What do you think eh? Not bad for half an hour of practice!? All in all, a lovely evening, lots of expectations met and more – and the best thing? The fragrance is only £19.99. I can’t belieeeeve the cost of perfume these days, a normal bottle can cost in excess of £50, so I was really surprised to find out the price point for the Yardley fragrance. Is Yardley a brand you’ve thought about for Fragrance recently? Have you tried Calligraphy or colouring in? What happened to Berol pens? !